Anyway, during my “free time” on Wednesday, I finally made a decision when the never filed stack of embroidery designs fell off the heap on my desk. Since my big table was clear, I took the papers there and sorted them for filing in my 4 embroidery design binders. Once that was done, I pulled out a couple that I loved, and grabbed some pre-washed towels that I keep at hand and got busy playing with the embroidery machine. These were fun to stitch out, and I played around with different methods for stabilizing, so it was educational along the way! Definitely a fan of hooping tear-away stabilizer, the SPRITZING it lightly with 505 spray, and pressing with my fingers, the towels towels to the now sticky stabilizer. I learned from experiments that plush towel or towels with nap need denser designs. I am pretty pleased with how these turned out. The design with the spoon is heavy enough to go on a terry towel, but the word KITCHEN on the dark towel is not dense enough. I still need to give them a wash, but I think they turned out well overall. The white towels are from the craft section at Walmart – they are called Aunt Martha’s Vintage towels and come in a package of 3 for a reasonable price. I like them because they are sturdy and have great hanging loops in the corner. The are LARGE too, 18×28 and wear quite nicely. Periodically I stitch them up and use them for gifts. They are meant to be used, and I think with using just tear away stabilizer on the back, they are very usable. The black dishtowel I purchased in a bundle, specifically to embroider on. It is a loop terry, and I won’t buy that kind again. I have a whole box of red terry kitchen towels to play with. I think they will get Christmas motifs. I’ve been saving them for a day just like this! 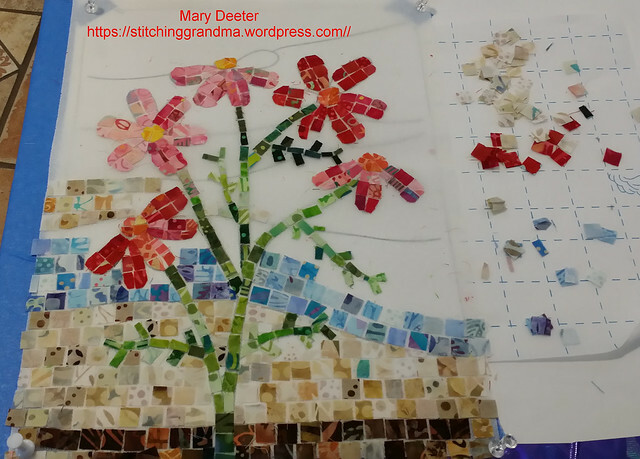 On Saturday, I had the opportunity to take another class from Cheryl Lynch (www.cheryllynchquilts.com) This class was held at Serendipity Quilt Shop in Dagsboro DE, and was the MINI-Mosaic Class. (More about that class in a minute). This is the 3rd time I have had the chance to take a class with Cheryl. 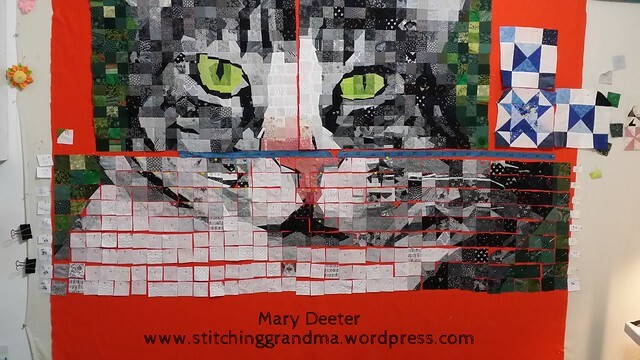 In 2014 I did a project in her class called Sensational Silk, when she taught at Ocean Waves Quilt Guild in Lewes De. 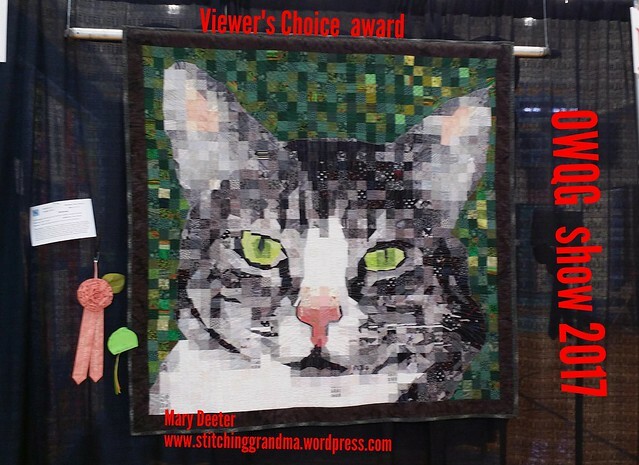 I was happy to take that project and “show it off” when she lectured in March at Helping Hands Quilt Guild in Dover DE. This small wall hanging is made from dupioni silk and batik. When I learned how to stabilize the silk for cutting into half square triangles, I had one of those “ah-ha” moments. I was later able to transfer the method to other “non-quilt fabric” when I made this baptism banner for my granddaughter. 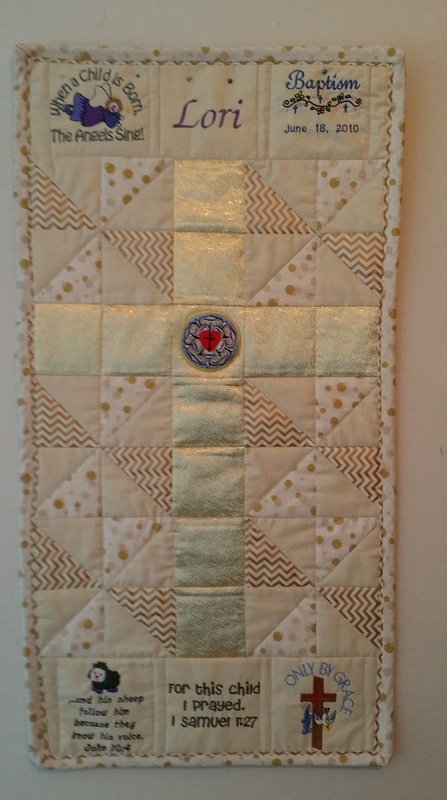 That shiny gold fabric was just “perfect” for the cross, but would have been a bear to handle without that stabilizing lesson I learned with Cheryl. When I had a chance to take another class from Cheryl, I jumped at the opportunity. 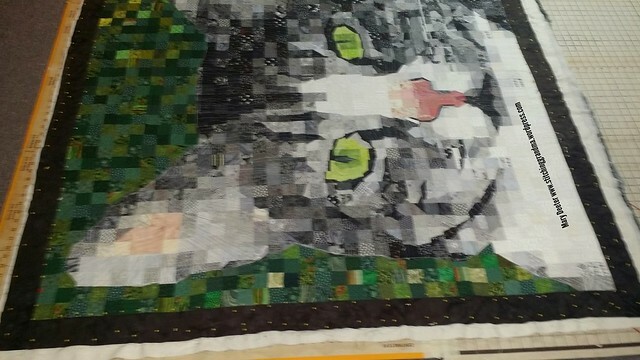 The mini-mosaic is a “much smaller” project than either the silk or the pet mosaic. 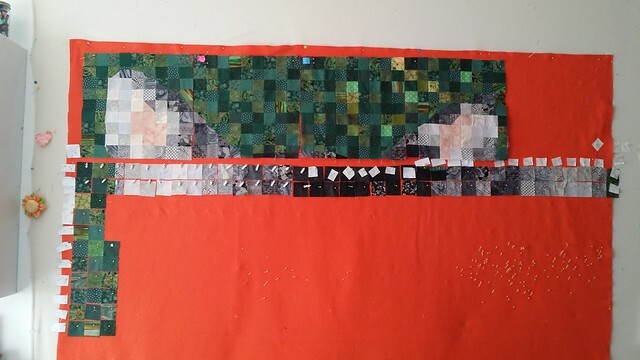 We used 3/8″ squares for the project! When I left the “all day class” – I came home and continued to work on the project after dinner. The finish size is somewhere around 11″ x 14″ after quilting, borders and binding. But for now, it is still a “work in progress. 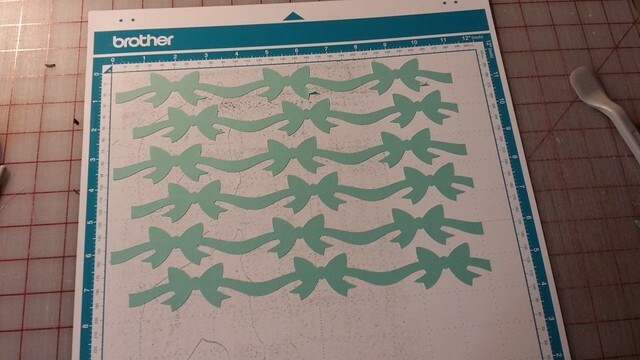 There are lots of steps to be taken yet, but Cheryl’s pattern is very clearly written, and I don’t think finishing it is going to be too hard. She was right, it is a bit addictive. In the project container Cheryl gave us everything we need to finish except our borders and backing. She even gave tips in class for hanging. Just curious – do you ever take classes from the same teacher? We are lucky to have so many venues in the mid Atlantic area where we can ! Note – each of the projects in this post have been written about previously. If you want more info on any of them, you can use the search function and the stated names to find those posts. 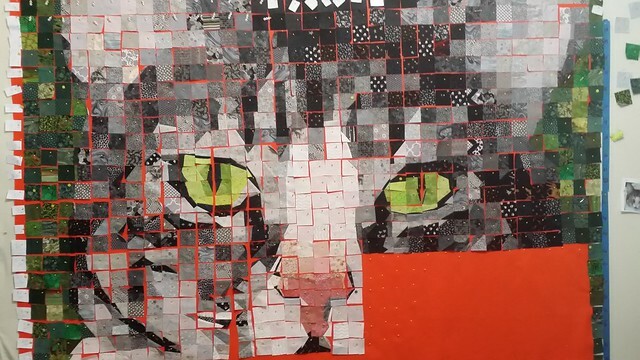 I am nearly finished with Mittens, my pet mosaic project I started in May of 2016. (If you click on that link you can go back to my FLICKR album and browse through all the photo’s). I’ve written many times about Mittens on this blog, and wanted you to know I have FINALLY reached the end! Mittens will be completed in the next day or two with a week to spare. I entered him into the Ocean Waves Quilt Guild Quilt Show which takes place on July 21 & 22, 2017 in Lewes Delaware. All that heavy thread work caused the sides of the quilt to pull in and make a “bow” in the sides of the quilt near the ears. 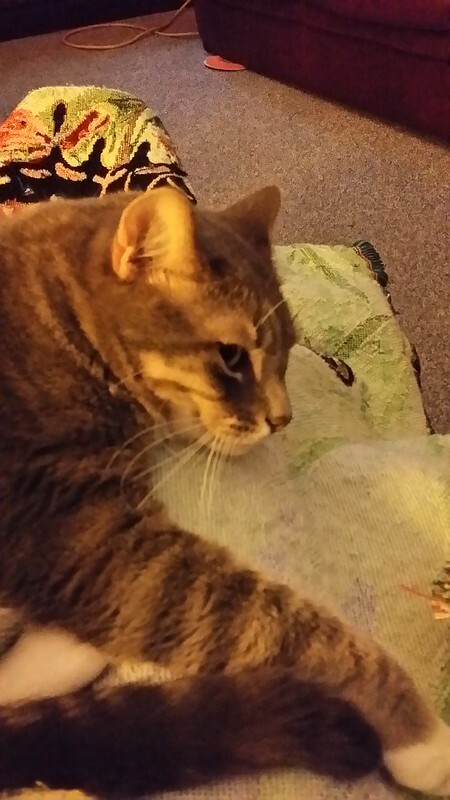 I needed to block the quilt. I went to the internet and read lots of posts on how to block the project, and compiled info from many sources for “my method”. Can you see how wavy the sides are??? I ended up on the floor with 2 of those old fashioned cardboard cutting mats, a carpenter’s square with a yardstick attached and about 500 pins, and two tape measures. I just kept working and working until it was as square as I could get it. The pins went through the project, into the cardboard mats and then into the floor! (Industrial carpeting!!!) 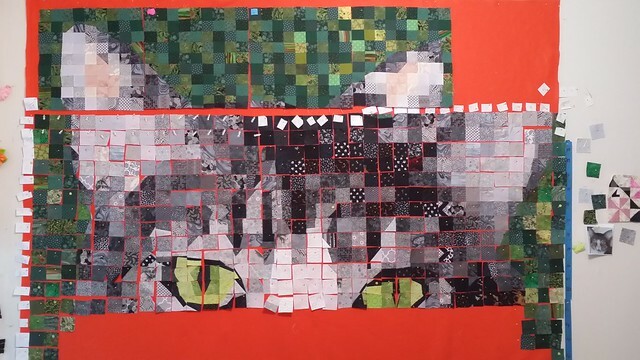 This took me nearly 3 hours as I worked to get rid of as much of the “curve” the heavy quilting caused. If you have a tip on how to keep that from happening, let me know! 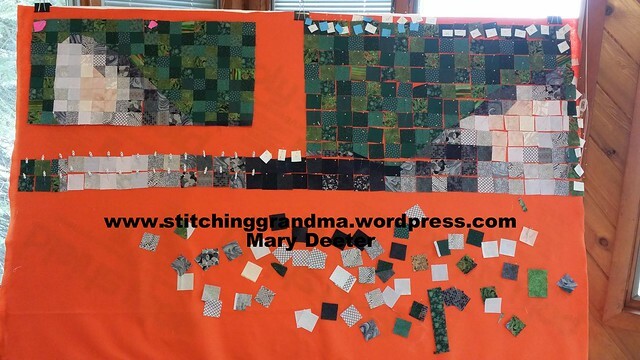 The project & borders were straight before quilting! I got the water bottle out and started spraying. I let it “soak” in and waiting an hour or so, and plugged in the iron, and steamed and pressed the whole quilt. After I was finished with the iron, I set a floor fan near it and walked away. I let him dry for about 18 hours and then I pulled out the pins, put him on the table and trimmed him up. While he was drying I got busy with making the binding and the label and the hanging sleeve. I did my label on my embroidery machine and edged it in some cute cat fabric. There are pieces of this fabric scattered out in the project. I stitched down 2 sides of the label in the edges of the binding, and fused to the back of the quilt. I still have to hand stitch around 2 sides of the label, and the bottom and ends of the hanging sleeve. 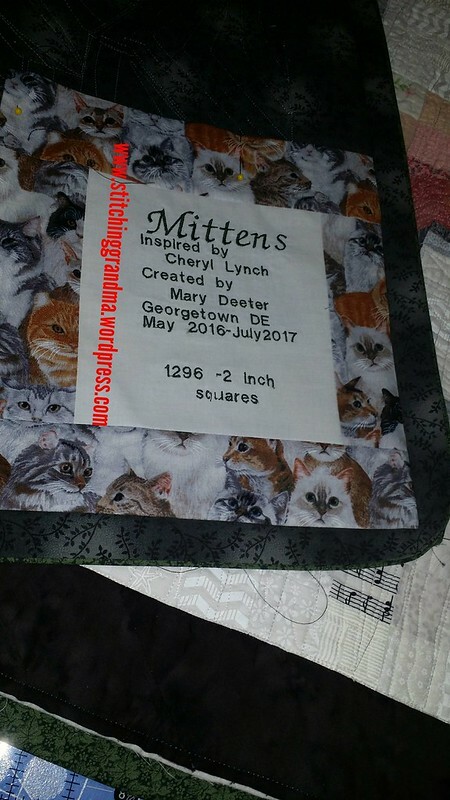 Since Mittens is a wall hanging, the top of the sleeve is stitched in the edge of the binding. Which binding? Well….Susie’s Magic Binding of course. It is stitched to the back of the quilt and READY for me to roll to the front and take those final stitches in the area of the flange. That is my project for this summer afternoon! What are you working on?? 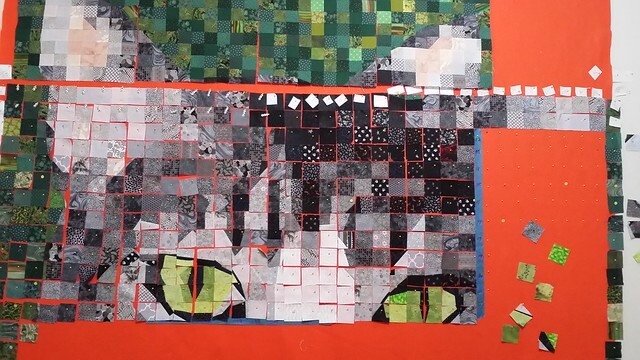 NOTE – Cheryl Lynch taught the class where I began the project – check out her website Cheryl Lynch Quilts . If your guild is looking for a great teacher & speaker, she comes with my recommendation! This was the look of my project when I packed up to leave the retreat. I came home from the trip, was faced with out “deadlines” and left everything in the bin until August. During August and September I got the project “out of the box” and back up on the design wall. 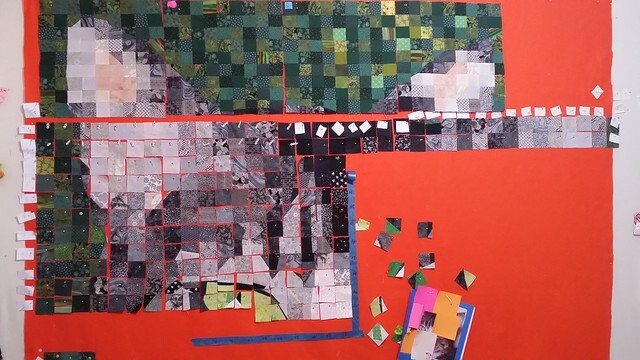 One 2″ square at a time, plus lots of additional angle piecing to “make the curves” work out. I got busy sewing once all the design work was done; but toward the end of September, the deadlines snuck up on me again! 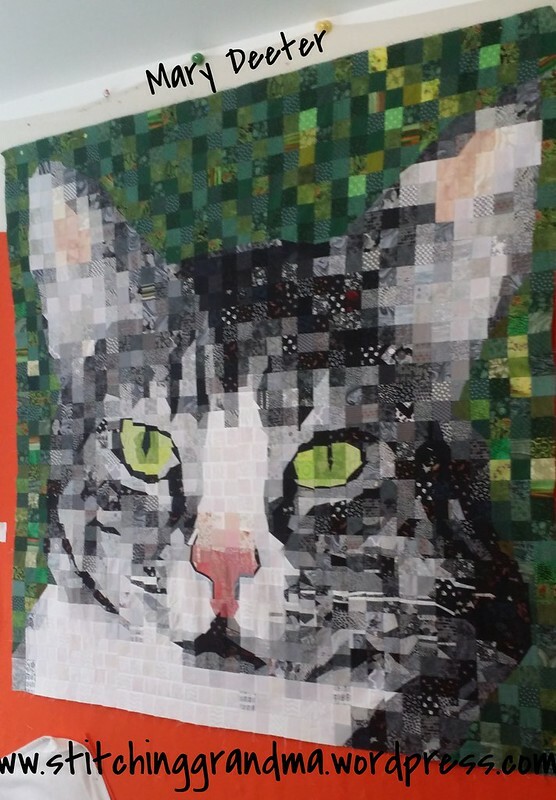 When I started thinking about UFO’s that I want to complete in 2017 I decided that MITTENS the Mosaic Cat would have to be # 1. A few days after I recovered from New Years, I got busy. Seriously, the hard part was done, it was just 5 or 6 days of sewing. In between model rail road club weekends, and a snow storm that dumped 8.5″, and 44 degree temps in my “over the garage” sewing room, I did some work. Yesterday I was able to join up all the sections . and I would like to report that he is “constructed” to include a 3″ border ! 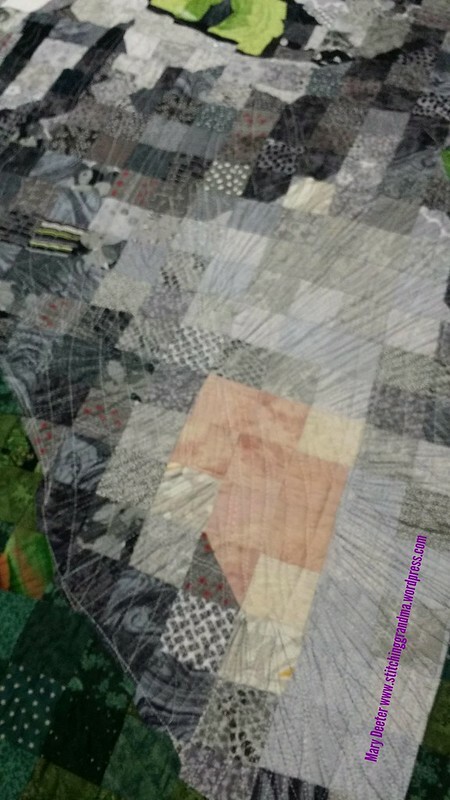 Thanks to Cheryl Lynch Quilts – http://cheryllynchquilts.blogspot.com/ for the great project and guidence. If you can take a class from her, you would certainly enjoy any project she will teach. This is my 2nd “Cheryl” project. 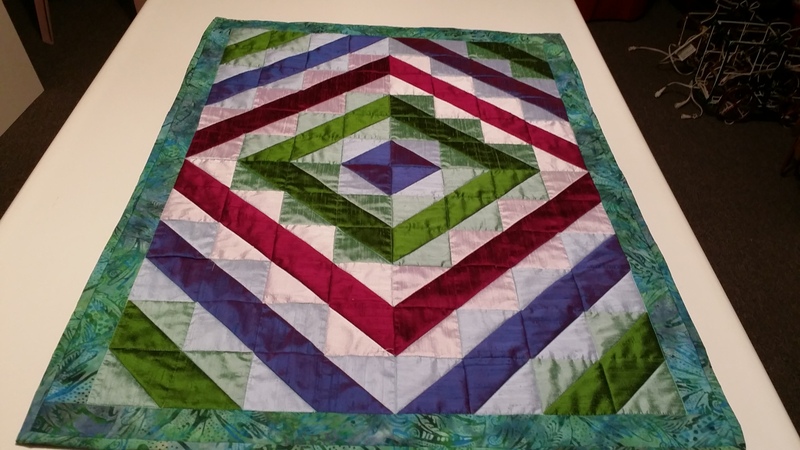 My first was in June 2014, when she came to Ocean Waves Quilt guild and taught a class with Dupioni Silk. The class was called “Sensational Silk” and I LOVED that project. I made a wall hanging and I just love the way the silk catches the light. It hangs in my living room. 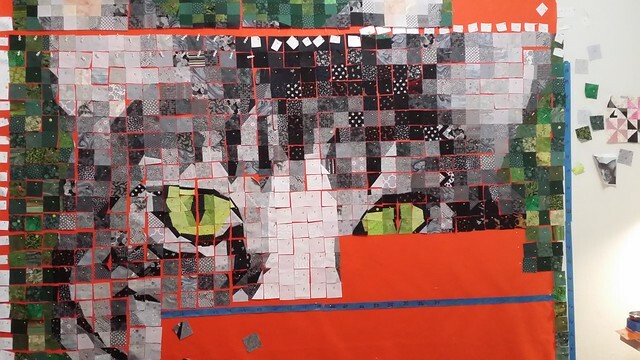 I now have a Janome 1600p quilting machine and frame, so I want to get busy practicing before I tackle this kitty! This set up has been “sitting” since early September, waiting for me to find time to use it. 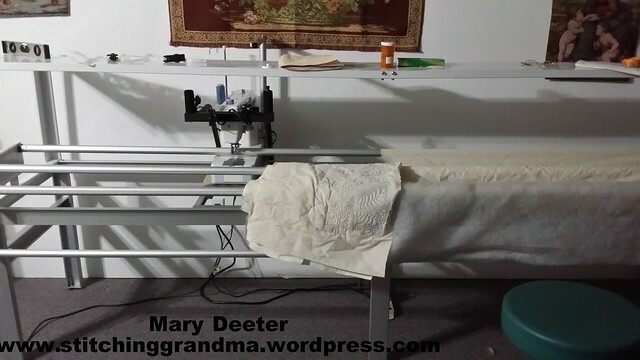 I now have a collection of needles and bobbins for this machine, and was “gifted a set” of leaders for the 12′ width; so I must load up a practice quilt and “get busy”. I am “anxious” to use these wonderful tools that I have and see if I can make good use of them. What is on your 2017 UFO list? 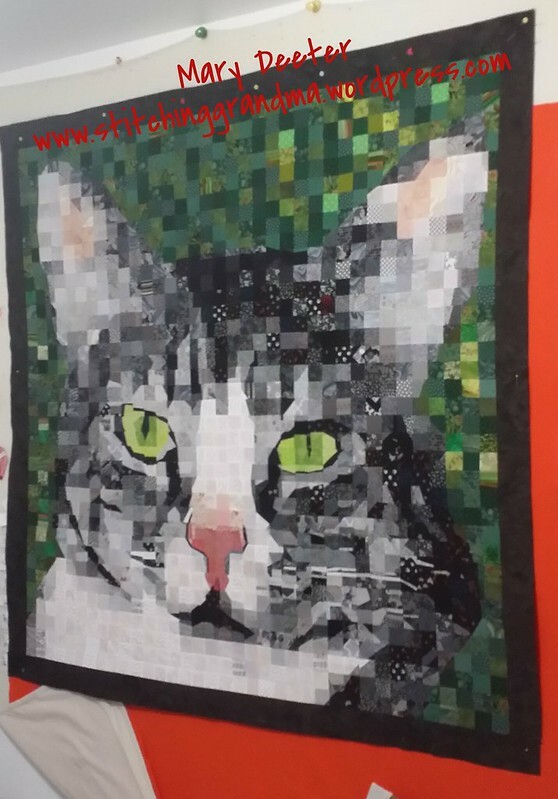 I have spent 2 months trying to “clear the backlog” of projects so I could get my pet mosaic “back up on the design wall”. Back story in case you are new — My sister-in-law, Carolyn (aka – One Block Wonder Woman ) flew in from California in May, and she and I went to a retreat hosted by Cheryl Lynch ( Cheryl’s blog ) . We signed up in JUNE 2015 for the May 2016 retreat. 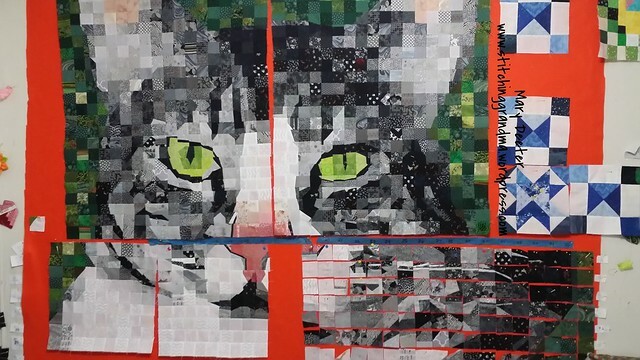 The project was a Pet Mosaic; finishing around 54″ x 54″. (What a great retreat by the way, in the Pocono Mountains, on a lake, with wonderful food and great instruction and inspiration.) (After you read my post, go check out Carolyn’s post about her project –Creating a dog from scratch can be Ruff . If this type of project interests you, Cheryl Lynch is a GREAT teacher. 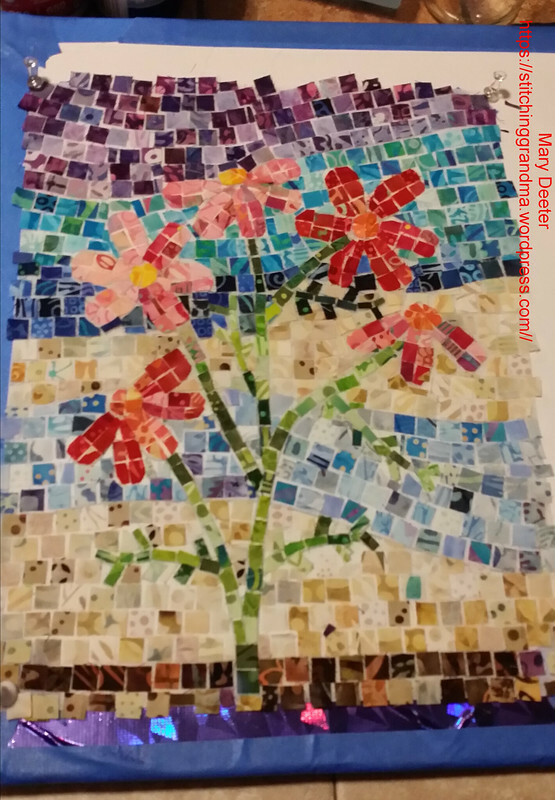 Flash forward to July and Carolyn’s project is finished! Quilted and bound, and making the circuit to quilt guild meetings, hanging at her local quilt show next month etc. 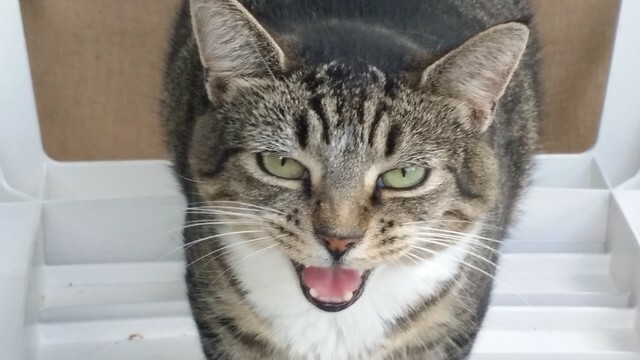 Meanwhile….mine has been languishing in a plastic bin on the shelf….waiting……waiting….waiting….so patiently (unlike the real live pet)…. 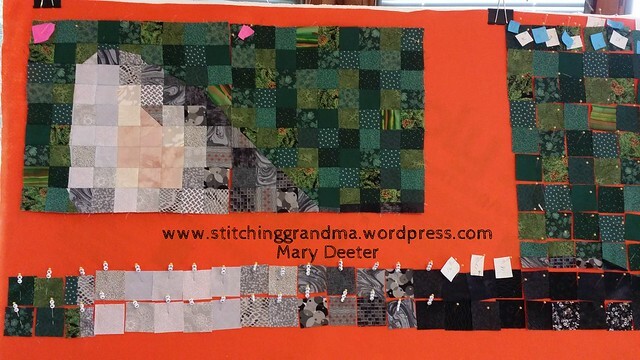 When I packed up to leave the retreat, this is how far I had gotten – two sections “stitched together”, and two more ready to stitch, plus 2 transition rows. So, here we are back on the wall at home, and I have joined the blocks for the first 9 rows. 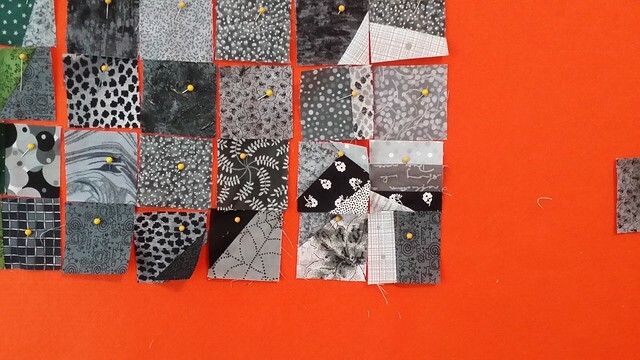 We are working in 9×9 sections for stitching, and much bigger area for design purpose. I’ve been thankful for the extra grey and black fabric that Carolyn mailed to me; which helps give more variety and texture. (did you notice all those pins on the right side…..convenience factor…they are all used….no wonder Cheryl said 500 pins on the supply list!) Even though I am working on a felt board, with the air conditioner, and the ceiling fan, I want my pieces “secure”. 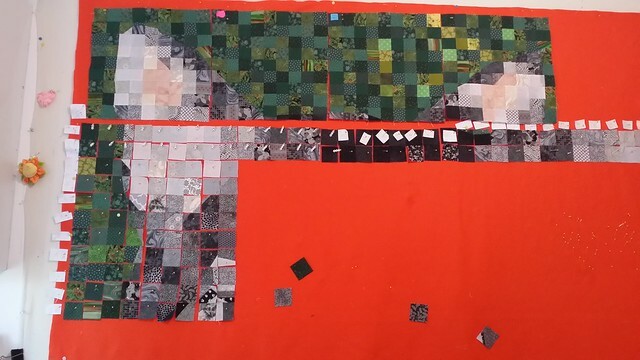 These are 2 ” squares, and in order to make the shape transitions, I am doing some minor “piecing” within the 2″ square. Sometimes I make a piece 2-3-4-5 times before I feel like I have caught the shape. And of course, I have to remember what will happen when the seam allowance comes into play. I am headed towards his eye and am trying to capture the shape and the changes of color in his eye, along with the light sparkle. So, you can see, I am using lots of methods to keep track of where I am. On the board I used row marking pins, then slips of paper to mark the columns and rows; and then I went with blue painters tape to define my field, numbering along the side and bottom. The photo I am working with is on the right in this picture, and I have blocked off (with post-it notes) everything except my area of focus. That helps. I was only going to work down 11 rows in this section, but I really needed to capture the shape of his eye, so I moved my tape down and will continue that area. And you can see those blocks that are just “hanging around” on the side of the board near the photo…well those are my “OOPS…not quite what I intended” pieces. Who knows, I may find a way for them to fit elsewhere. 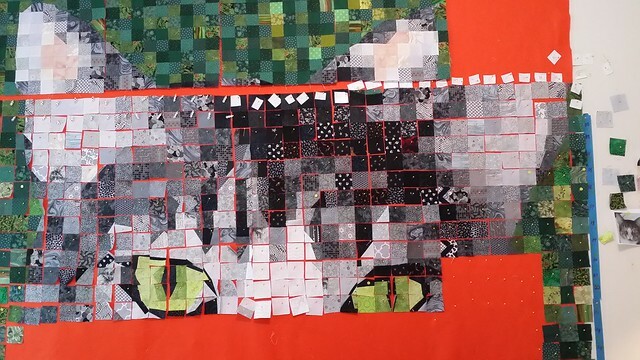 I feel pretty good about how Mittens the Cat is progressing in this project. 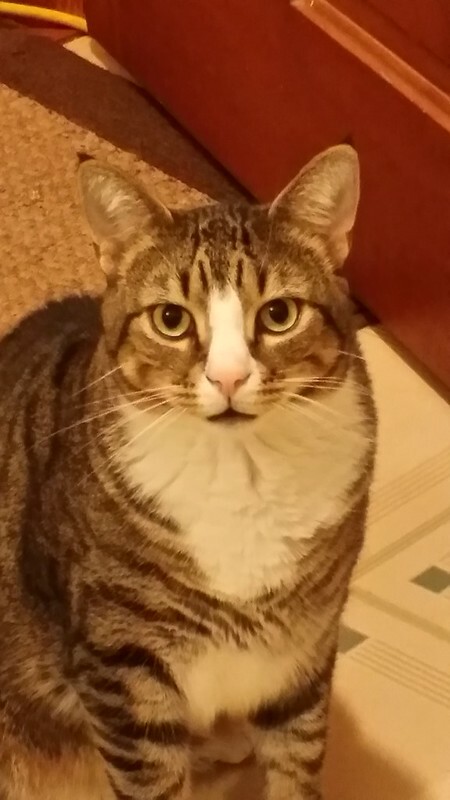 Below is what he really looks like….hanging out. In this picture the lighting isn’t great and he looks like he has a brown cast; but he is grey, black and white. 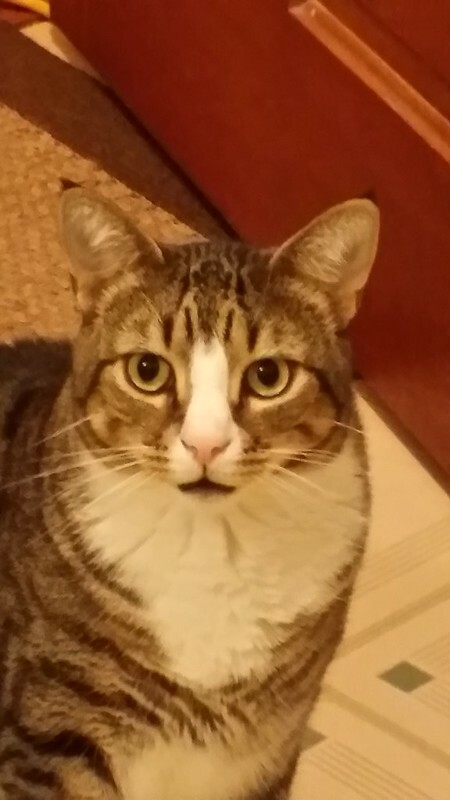 It is his pink nose that I love. And those little tufts at the top of his ears! 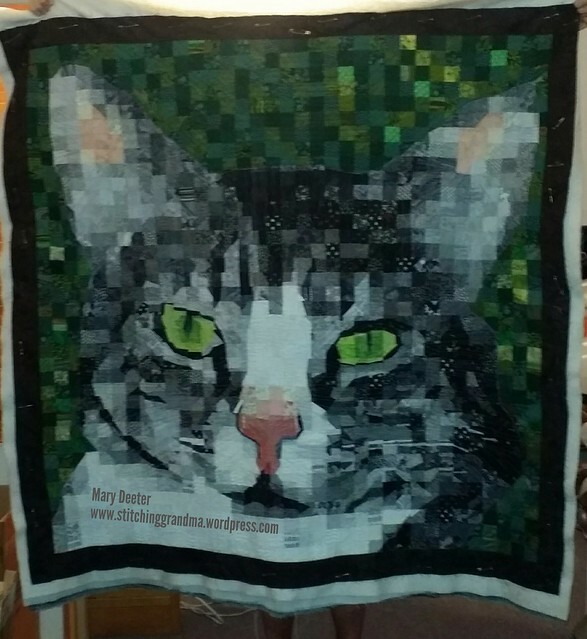 He has such great markings, and I am hoping once I move on to the right side of the project, that they will start to show better in the fabric placement. So, this will be a long process; and I am going to work at it as much as I am able. I have my little interruptions – quilt bees, quilt show meetings; more quilt bees, more quilt guild meetings; etc. I am not going to rush it. I have been “standing back and looking” and find pieces I want to change, so I do. I wanted to share with you the fun stuff I made for one of the grandchildren’s birthdays in August. She wanted a “HORSE” birthday party…and Grandma got commissioned to use her Brother Scan’N’Cut machine again….. I cut out 2 different sized silhouettes that my daughter used for various purposes on the day of the party. 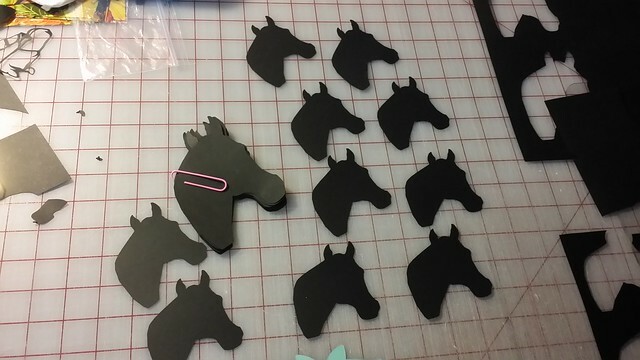 Then I cut out some BOWS for the “pin the bow on the pony” game. 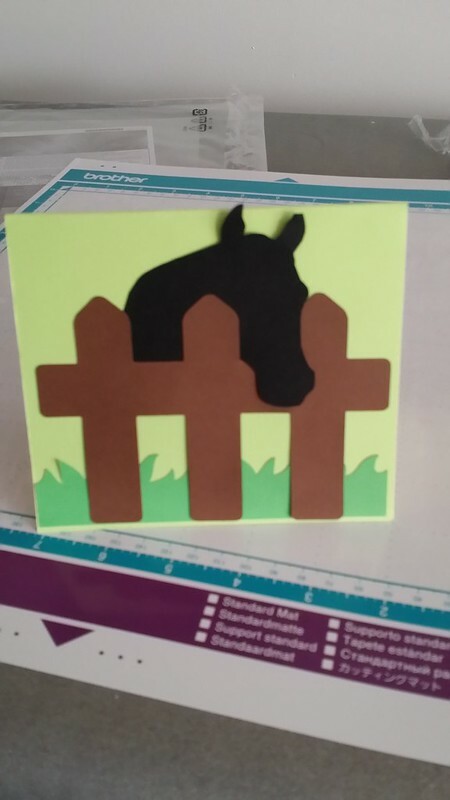 The fence and the grass were built into the machine designs, the horse head I found on-line and imported. I’m not sure that I will do a lot of “stamping” and “card making” , but the little bit I have done I have enjoyed, and my ScanNCut machine makes it fun! I have to report that I finally learned about the “pressure” setting after destroying one mat this spring. I have purchased a new mat and when I did this cutting, I had no problem. At a recent quilt show, I talked to the Brother dealer who was doing demo’s on the machine, and she gave me a worksheet that had listings of settings for different materials. That was very helpful too. I do need to get a bit more variety of papers, as PINK was a requested color and I used it all up this spring with the BARBIE stuff I cut for a 6 year old’s party. I invested in envelopes (50 pack); so now I need to focus on cards that are the “right” size for the envelopes I have. 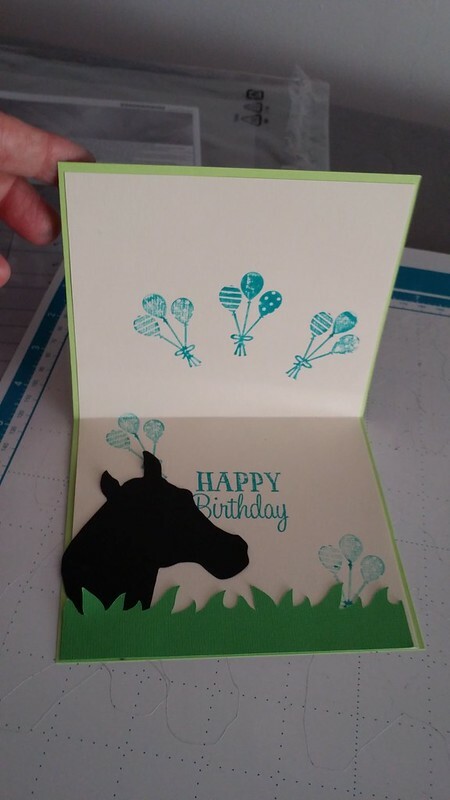 Last spring at the card making class I went to, we saw a demo on how to make our own, but I didn’t “LEARN” well enough……. I will keep watching the video’s and try to learn a bit more. It is dangerous now for me to go into Michael’s Craft Store or Hobby Lobby or A.C. Moore. Good thing there is not one in town! Hope your sewing & crafting adventures are bringing you joy!